Best Windows Movie Maker Alternatives: For a long time, Windows Movie Maker seemed to be the undisputed king of the video editing softwares (tools) or video editors. But in recent times this software from Microsoft Corporation was not able to keep up with the upcoming market of Android apps available for the purpose. So, with the advent of windows 8 and Windows 10, these guys decided to do away with this tool. Now it’s not even available to be downloaded separately. So, our experts have comes up with a list of top 5 software which are the best alternatives to fill the void. Many Hollywood graphic experts use this tool’s pro version to tweak the scenes! At least that’s what the word is around. So, there ought to be at-least some substance in this tool which nears it to make this rumor a reality. And that is what our testers wanted to know when they started using it for this list of ours. If Windows Movie Maker’s way too simple kind of layout was what restricted your height of the flight of the imagination, here is the perfect remedy. It’s free for personal use, and the professional version is also available which provides you more export options among many other attractive ones, is also available for a very nominal expenditure. Both the versions come to a prepacked plethora of features to choose from. In fact many detest this tool because of the complexity it creates for the starters. So, if you are very much hooked on with the simple and straight interface of the Windows Movies Maker, it will like taking a big step forward if you opt to start using this. But need not worry as official websites also provide with a long list of tutorials to get you started. Straightforward and simple- that is what used to be Windows Movie Maker’s forte. And if you are looking for something which provides you with these tags, this is where your search ends. VideoPad resembles Window Movie Maker in every possible aspect. In fact, our experts feel that its simplicity is the reason it can’t stand out in the face of Android apps used for editing. Still, this one has got some tools from this era like 4K video sharing, stereoscopic 3D conversion, direct sharing to social media, and chroma keying. Its ability to export videos is a feature which is available mostly in paid version only. VideoPad Video Editor has a simple drag and drop kind of user interface get you started within seconds, without much complication. You won’t feel a bit that you actually have changed your editor. This one also has a paid version which gets you with more options to export your videos you have the freedom to use as many audio files as you wish. Other than that, you get almost everything you can hope for in free version itself. 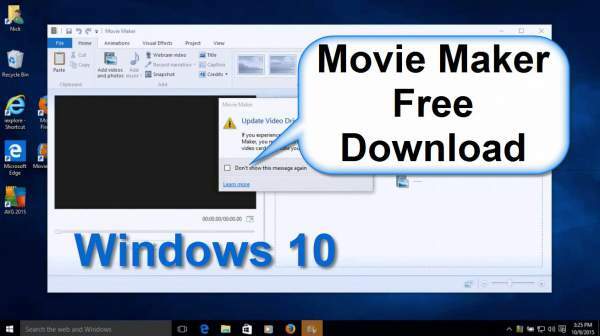 This is the simplest tool to make it to our list of top 5 Windows Movie Maker replacements. Very basic features- that is what this tool is called for! Avidemux lacks some of the features like a fancy interface or direct sharing to social media, even then its worth a shot. The good thing is that you get preset profiles to get video outputs for different devices, which makes the task of producing a perfect output a piece of cake. The other side of the coin is that while using Avidemux, you cannot combine videos that are different heights or widths. But still, this doesn’t pose as big a problem as it seems because most of the users get all their videos from the same source. But what if that is not the case? What if you have got three videos with three different layouts? In that case, you will have to resize each clip separately, export it and then make a new project. So, beware of this problem if you are going to opt for this tool. Developers are aware of this issue and may get resolve in future updates. Start using VSDC and you are surely going to become a fan of its retro-style filters and animations. This simple tool does look a lot more different than Windows Movie Maker, but still, it has got everything WindowsMovieMaker had including more. There are a lot many features to experiment with no need to worry because of its complexity as at the very start, you are given an all-around tour through its different wizards. Once you’ve selected your source files and put them in order, you can add annotations, effects, cursors, notes, and charts. Here it is to be kept in mind that when you will try to export your video for the first time, you are bound to get a message stating that you can’t do so as you have used Premium features. Now, what is this? How can this be if we are using it for free? Actually, this occurs because we use hardware acceleration, which is a paid feature but still you get to see its demo in the free version as its On by default. You can turn it off by clicking Options (in the top right), selecting Acceleration Options and unchecking ‘Use hardware acceleration for encoding video’. Another good thing about this tool is that developers are constantly striving hard to give you the most sophisticated services available. And so, every once in a while, we get an update with many more features added! So, it’s one of the best alternatives to Windows Movie Maker. At the very first look itself, it became quite clear that we have got a winner. Its user interface is quite similar to that of Window Movie Maker and comes with easy drag and drop kind of usage policy. Just like you used to do with WMM, here you add videos and audios and then simply drag and drop them to your timeline in the manner you want them to be. You can also rearrange them later according to your wish. Once you’ve got everything in order, hit the Filters button, and then click the plus sign to apply transitions and effects. You can apply as many effects as you like, including colored filters like those available in Windows Movie Maker. Along with these traditional effects, you also get to have options such as chroma key compositing for green screen effects. Along with these traditional effects, you also get to have options such as chroma key compositing for green screen effects. And not to forget, its ability to have your own titles and watermarks. These are a feature mostly seen with paid versions of the video editing tools. And to top it all up, Shotcut is open source software which makes sure you won’t have to spend any bucks to avail its features. See: Sites To Watch Movies Online. So, this was the list of best Windows Movie Maker alternatives. Which of them is your favorite free video editing software (video editors)? Stay tuned to TheReporterTimes for tech updates.